“Jason Bourne” is yet another one of this year’s sequels that were made solely out of commercial interests, and not because someone had a good and interesting idea for it. Sometimes, with the right team, even that can work (see last years “Jurassic World”). And even though it’s just a rehash, it’s at least still better than “The Bourne Legacy”. However, rarely has a sequel seemed so unnecessary and also kind of outdated than this one. When “The Bourne Identity” came around, it felt fresh and new. By then – as evidenced by “Die Another Day” – James Bond (arguably Bourne’s biggest rival) was stuck in kind of a rut, putting too much emphasis on gimmicks, gadgets, hyperreality and self-parody. Bourne was the logical response to that, offering a harder, more serious and also more down-to-earth alternative. The sequels, with Paul Greengrass on directing duty, were also crucial in establishing a new style for action film, for which movie critic Vern coined the phrase “Post-Action”. Personally, I might not like it, but I still can acknowledge that in the following years, almost all action films followed the template that the Bourne-movies established. Recently, however, we’ve (thank god) seen a comeback of more comprehensibly shot action, with longer, fluid scenes without any cuts, slow motion etc. Thus, the action presented here feels strangely out of date. Then there’s the fact that, very much following the Bourne-model, the Bond-reboot with Daniel Craig also went tougher and more down-to-earth. Back then, I was very skeptical about this approach, claiming that instead of trying to do Bourne 2.0, they should rather cater to Bond’s strength – the charm, the humor etc. – and emphasize what it is that sets him apart from the competition. 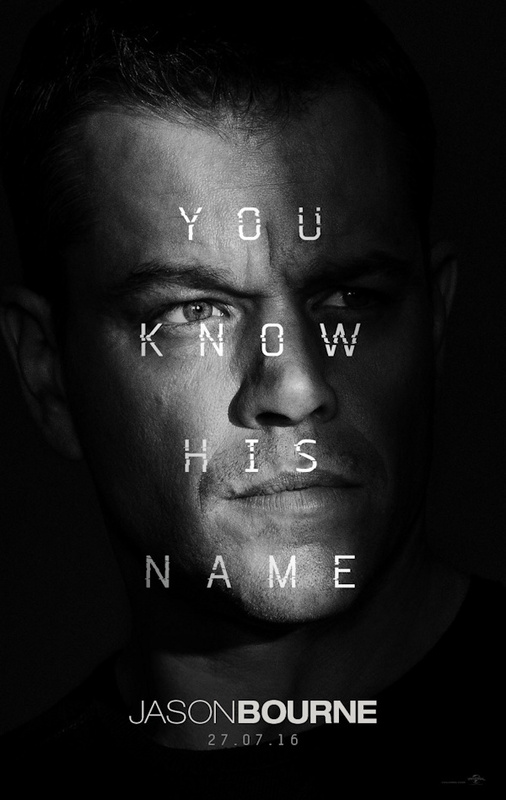 However, in pretty much copying Bourne, they managed to make him obsolete – as proven by “Jason Bourne”. The former pioneer has become the dinosaur, desperately hunting after its own success. And in a world where the 007-films recently managed to successfully merge the old and the new, and where the “Mission Impossible”-movies keep getting better and better, an argument can be made that we don’t need Jason Bourne any more. Sadly, the fifth movie of the franchise fails to belie that statement, and to make him relevant again. That’s far from the only problem of the movie, though. It also suffers tremendously form the fact that Bourne’s story was concluded in the trilogy, and it’s obvious that they struggled to find a good reason to bring him back. All three previous movies had some sort of mystery that hooked you right away: Bourne’s amnesia in “Identity”, the way he gets framed in “Supremacy”, and finally, the background of the Treadstone-program that he was a part of in “Ultimatum”. This time, however, the new revelation – about his father’s role in the program – is hardly interesting, and (worst of all) retcons one of my favorite parts of “Ultimatum”: Bourne finding out that Webb volunteered for the program. There are also almost no connections to the previous movies. Apart from Bourne (and some flashbacks), Nikki is the only veteran to appear, and even she’s only there to get the ball rolling, and exits the movie almost as quickly as she appeared. Which is another reason why the whole movie, like “Legacy”, feels tacked on (instead of an organic continuation of the story, like the first two Bourne-sequels did). Then there’s the fact that I just didn’t think that the story that they told here was especially interesting and/or revelatory (so the CIA is spying on us. Huh. Never would have guessed!). And as much as I can understand that Greengrass wanted to keep visual continuity with the previous movies, in neglecting the recent trend in action movies for more elegance and clarity, “Jason Bourne” (in stark contrast to his predecessors) feels outdated, instead of revolutionary (or at least contemporary). Despite all of that, it’s slightly better than “Legacy”, and overall, even though its doubtless a totally unnecessary sequel, it’s not a terrible movie in itself. Mostly, that’s due to the action scenes, with the first pursuit in Greece as well as the car chase in Las Vegas two particular highlights. His very fast and shaky style of directing action scenes might not be my personal favorite, but compared to many of his imitators, Greengrass at least knows what he’s doing. Thus, he manages to keep at least some clarity that lets you decipher what’s going on. Part of that is due to the fact that compared to others, while he might shake the camera around quite a bit, he at least mostly cuts only about once every second (compared to five to six times, as I’ve counted in “Taken 3”, for example). Also, when he cuts, he does so in a way that one shot flows into the other, kinda telling the story of the moment. I might not like his style, but at least he’s mastered it like few others have, and that definitely counts for something. And shaky-cam or not, the chase in Las Vegas was quite spectacular. Despite anything, it was also nice to see Jason Bourne again (even though the place where we find him in the beginning was definitely reminiscent of “Rambo III”). I also quite enjoyed Heather Lee (played by the wonderful Alicia Vikander, who is very good even when she phones it in, as she seemed to do here), who I felt was a great addition to the Bourne-lore. And despite its shortcomings, “Jason Bourne” at least was mostly entertaining. Unlike the trilogy though, which I’ll definitely revisit again soon, I highly doubt that I’ll ever watch it (or “Legacy”, for that matter) again, and overall, I think it’s high time to lay the franchise to rest once and for all. This entry was posted in cinema 2016, movie reviews, new releases and tagged 2016, action, Alicia Vikander, cinema, Jason Bourne, Julia Stiles, Matt Damon, Paul Greengrass, thriller, Tommy Lee Jones, Vincent Cassel. Bookmark the permalink.